Paddy Power are one of the biggest sports betting brands in the world and they stand apart from the competition thanks to their distinctive advertising campaigns, early payouts on big sporting events and money back specials available on a weekly basis. This Irish bookmaker have become a firm favourite with many customers who show unswerving loyalty to an operator who has recently joined forces with Betfair to make them bigger, better and more technologically advanced then ever before. Only first deposits using a debit card, credit card or PayPal will qualify for this promotion and you get the best of both worlds with this offer. Either a winning first bet and some profit in your Paddy Power account or money back from a losing first bet! 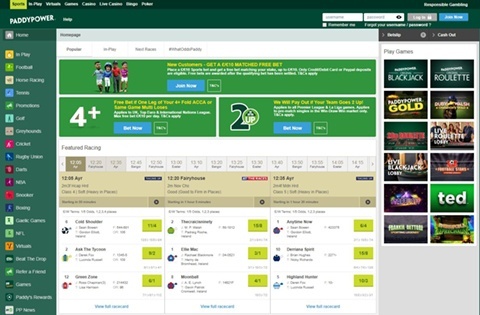 Paddy Power are one of the best bookmakers when it comes to Cash Out, an innovative new feature which allows customers to close out their bet for either a profit or a loss before that particular bet has been settled as a winner or a loser by the operator. Locking in a profit is the aim for many customers, especially with football accumulator bets, with players loving the chance to walk away with a cash amount before the final leg of their acca is played to avoid losing a potential big return. There is a Cash Out tab next to the Bet Slip where you can see the available bets that can be cashed out, with the Cash Out value being higher, lower or the same as your original stake considering whether your bet is in a more advantageous position or not. As it says on the website, Paddy’s Rewards offer customers more than just free bets and Paddy Power certainly know how to encourage loyalty. You can get a free £10 sports bet every week simply by placing five bets of £10 or more online which effectively means unlimited free bets. You can also claim a free £5 Games bet every week at Paddy Power providing that you stake at least £50 on online slots games, with the Irish bookmaker also offering fantastic prizes such as a trip to New York where you can earn up to three entries into the prize draw every week. In addition, Paddy Power also have some brilliant football promotions running including where they’ll pay out if the team you’ve backed lead by two goals during a match. There is also a free bet available if one leg of your accumulator lets you down, something that applies to the majority of football punters. Home of the Money Back Special! Many betting customers will visit Paddy Power as their default bookmaker when it comes to punting on the big football matches. That’s because there is nearly always a Money Back Special for a Merseyside, Manchester or any London derby which means you get cash back if a certain player scores. Paddy Power are also renowned for paying out VERY early on certain key events. If Manchester City are ten points clear at the top of the Premier League, you might expect customers to be paid out well before the season ends. The same applies in the relegation market and that’s why you should place outright bets with this firm. One of the latest promotions is something called Beat the Drop where customers get free entry for 30 days. There is £1,000 on the table when you play and it’s a simple case of trying to answer ten questions to try and keep your hands on the loot. Yet another way in which Paddy Power stand out from the crowd. 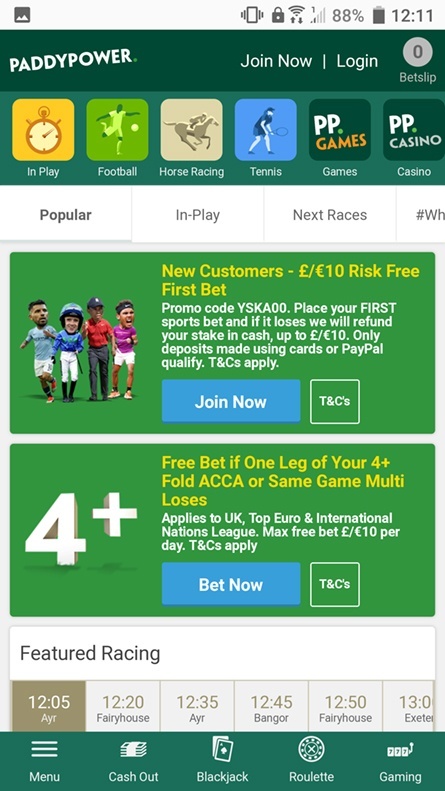 The Paddy Power App is available on Apple and Android smartphones, with this operator having invested heavily in creating something which is super fast and they’ve clearly improved the design of the app to make it simple for a customer who is betting on the go. 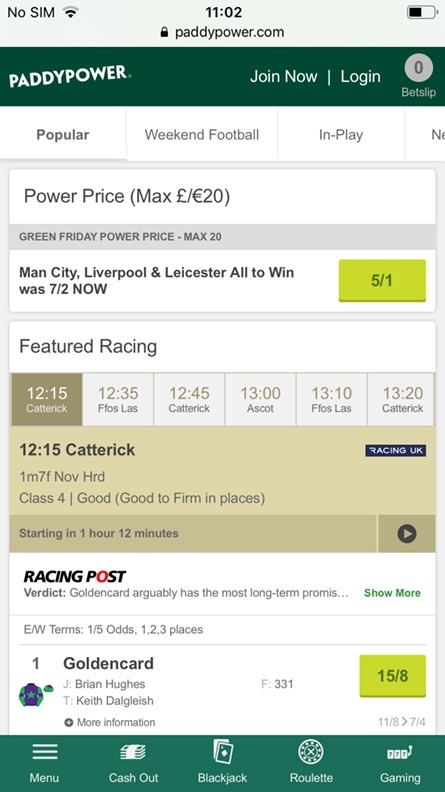 We would say there are definite advantages to downloading the Paddy Power App rather than using the mobile browser, with navigation a lot more straightforward with the former and the page loading speed tends to be a touch faster depending on your signal. Live Streaming can be accessed through the mobile app and there is the ability to log in with Face ID or with your fingerprint which saves having to type in username and password every time you want to place a bet. There are regular updates which means new innovations are constantly being loaded in to improve the user experience. Paddy Power are brilliant when it comes to customer service and this extends to the sheer range of payment methods available to customers. Many players like to use their debit or credit card in order to make a deposit or withdrawal, with all funds ring-fenced to ensure maximum security and you know you’re in safe hands with this operator. There are also alternative payment options, with PayPal proving popular and the same applies to paysafecard, Skrill, Cash Card and Cash Card PPlus. The minimum deposit is £5 when using debit or credit card, while the minimum withdrawal is £10 and you should receive your funds within 2-3 working days. The Paddy Power Casino is very much a standalone product in its own right, with new customers able to choose from a series of bonuses when they first get started. The virtual lobby features over 150 games and customers can access casino games either through the download version on their PC, the instant version on their Mac or through your iOS or Android device instead. The first promotion requires customers to “claim” the bonus with a minimum deposit of £10. That allows you to claim a £40 bonus and 10 Free Spins are available once this bonus has been redeemed or lost. A further 10 Free Spins are then released the following day. Alternatively, you can claim a 100% deposit bonus which is triggered with a first deposit of £20 or greater. Paddy Power Casino will match your first deposit with a bonus to the same stake and there’s a maximum of £100 that can be claimed. Once your bonus has been redeemed, 5 Golden Chips are also made available. Finally, you can claim a 200% bonus up to £200. If you choose to claim this bonus, you’ll need to wager the amount of bonus 35 times which means that the turnover requirement is significantly higher than you will find with the other bonuses but you do get a greater reward. Paddy Power sportsbook has a Rewards Club and there’s something similar with the Paddy Power Casino where customers can enjoy entering different prize draws where they can potentially win a VIP trip to a glamorous location like Vegas, the most famous gambling city in the world. Paddy Power Casino regularly set up something called the Vegas Leaderboard where there is £30,000 to be shared out between customers and there’s also a top prize of a VIP trip for two to Las Vegas plus a stack of bonuses and free spins that are made available. Who doesn’t like playing for a Progressive Jackpot? The Paddy Power Casino are above average when it comes to slot games linked to huge jackpots, with over forty choices and the jackpot amounts differ according to whether they are local ones to this operator or part of a wider network. Some of the most popular casino jackpot games include Age of the Gods, Top Trumps Football Stars, Frankie Dettori Sporting Legends, Gladiators Road to Rome and Pharaohs Treasure Deluxe. You are always just one spin away from a life-changing amount of money. You can play Paddy Power Casino slot games for as little as 1p per spin and there’s the choice to play either the download or instant version depending on the platform which you are using. Either way, the game choice is substantial with over 100 of the best online slots featuring several different software providers. Our biggest reason for playing at the Paddy Power Casino is the phenomenal range of Live Dealer Casino games available, with the Irish operator providing customer with a huge amount of choice when they want to experience the thrill of playing remotely with a land-based casino. There is a Live Roulette Lobby and a Live Blackjack Lobby which allows you to enter and choose a table which suits your particular bankroll, while there is also Live VIP Roulette for those high rollers who want to gamble big stakes when they go to the table. There are friendly dealers available ready to deal the cards or spin the roulette wheel and you can engage in friendly chat when you play. The live stream that you access provides a high quality picture and we recommend the Live 3 Card Brag Lobby, the Live Casino Hold ‘Em Lobby and Live Sic Bo Lobby.